Hanoi (VNA) - Rail tracks located in the inner city have caused problems for Hanoi’s traffic, however, this will be addressed in the future when city planning is completed. Transport Deputy Minister Nguyen Ngoc Dong made this comment referring to the proposal to move Hanoi railway station out of the inner city. “Traffic congestion (caused by the railways) is indeed taking place, at present. In the future, the rail tracks will not cause traffic jams. The Cat Linh-Ha Dong rail route will run on an elevated rail track or the Nhon-Hanoi rail route will be underground. We will address the problem,” he said, indicating he was not in favour of the proposal. He said the Hanoi transport development, including Hanoi railway planning, has been scheduled. According to the Vietnam Railway Corporation, there are 5,564 crossings between rail tracks and roads nationwide. Hanoi has the highest number of crossings. There are also a large number of national rail tracks running parallel with Hanoi’s main roads, such as Le Duan and Giai Phong, and crossings between rail tracks and the city’s main transport routes, including densely-populated intersections such as Kham Thien, Dai Co Viet-Dao Duy Anh, Truong Chinh and Linh Dam peninsula. As a result, trains are banned from entering and moving out of the inner city during the rush hour, which is when there are maximum passengers. This has limited profits of the railway sector. Vu Anh Minh, chairman of the Vietnam Railways Corporation, said railways worldwide have two advantages - safety and location in the inner city to meet travel demand. He said major cities such as Paris, Tokyo, and Frankfurt have their national railways located in the city centre, which is connected with inner cities’ railways. He said if the railways were not located in the city centre, small-sized vehicles carrying passengers to the suburbs would increase. “Hundreds of other vehicles replacing a train carrying 700 to 1,000 passengers still put pressure on the inner city’s traffic,” he said. 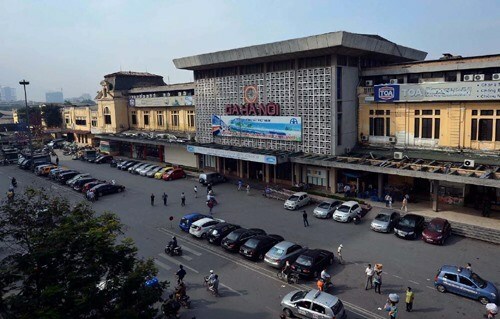 In early August, the Hanoi Police Department proposed to move the Hanoi Railway Station and all inter-provincial rail tracks to the suburbs to avoid traffic congestion and fatal accidents in the inner city. Figures from the city’s Traffic Safety Steering Committee show that in the first seven months of this year, as many as 14 traffic accidents occurred on railroads, leaving 13 dead and many injured. Most of the accidents occurred at intersection points or crossings between rail tracks and streets as drivers and pedestrians failed to observe or obey railway signals. The Ministry of Transport is also collecting opinions on its website to draft criteria to determine “black spots” of railway accidents.